MAGNIFICENT VERY LARGE REPRODUCTION OIL ON CANVAS OF CLAUDE MONET'S FAMOUS PAINTING " Le bassin aux nymphéas". BY THE FABULOUS ARTIST DAVID ALDUS.This is the painting that sold recently at Christies for a world record $80,451,178 !!!!! The painting was bought into private hands so ultimately it can never now be seen!! David Aldus has decided to free it !! He has painted it true to it's actual enormous size.This Lovely reproduction painting uses oils ever more transparently, and turned to an evocation of almost pure light by use of shimmering colour.He has captured Monet's wonderful reflections in the water. 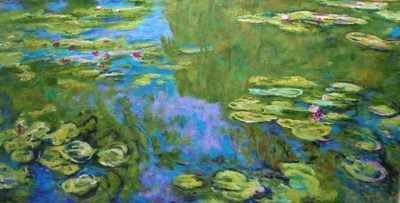 Water Lilies (or Nympheas) is a series of oil paintings by French Impressionist Claude Monet (1840-1926). The Lily paintings depict Monet's flower garden at Giverny and were painted as Monet suffered from painful eye cataracts. (Highest price received for one of Aldus's paintings is £10,000 !!! Absolute investment opportunity! ) Measurements True to the Original Monet Height 39½ x Width 79 1/8 in. (100.4 x 201 cm.) (6 FT x 3 1/2 FT ) Oil on canvas. .
David Aldus the artist has exhibited with the Royal Society of British Artists (R.B.A); the Royal Institute of Oils (R.O.I) and the Royal Society of Marine Artists (R.S.M.A) He has been nominated twice as a finalist in the Garrick/Milne prize exhibition held at Christies LONDON. His work has been selected for the Discerning Eye Exhibition by Art Critic, Edward Lucie Smith, where all his work was sold. He also sold all his work at the Lambeth Palace when exhibiting under the auspices of the Royal Society of Marine Artists. Highest price received for one of his paintings is £14,000. "Lot's wife" see davidaldus.com . This painting was the same size as Turner's Hannibal crossing the Alps 5 foot by 8 foot. David Aldus also sold "A tribute to the people of Malta" that sold for £10,000. The same painting was the subject of a congratulatory letter from Queen Elizabeth II. Lord Lewin, Admiral of the Fleet also sent a letter of congratulations.He has held one or two-man shows at Knightsbridge; South Kensington; Windsor and numerous other venues. He has exhibited in Westminster Central Hall; Royal Festival Hall;Birmingham's Royal British Artists exhibition;Victoria Art Gallery, Bath; Rooksmoor Gallery, Bath; London Guildhall; Mann Island, Liverpool; Christies, the London Auction House, etc. GUARANTEED TO BE 100% ORIGINAL AND GENUINE WITH C.O.A.